For me, it's always a delight when I find a hotel that allows me to feel like I'm outdoors while still enjoying the luxury of a boutique property. That's what I found at Hotel Pulitzer in the old quarter of Amsterdam. Basically down the street from the Anne Frank House and overlooking two scenic canals, Prinsengracht and Keizersgracht, the location can't be beat. But one of the things that makes this property so endearing is that the hotel is made up of 25 merchant houses that date from the 17th and 18th centuries. They're all connected by a series of mostly glass-enclosed corridors that lead to my favorite hotel feature: several leafy courtyards. As I roamed around the hotel, I strolled along corridors that zigged and zagged, and then climbed up and down short sets of sometimes steep stairs, all understandable given the different character of the more than two dozen different structures that comprise this eccentric but elegant accommodation. The rooms in the front of the property have wood floors and low ceilings and are completely different from those in the rear which come with wall-to-wall carpeting and high ceilings. For those who love sunlight like me, room #326 will be your favorite -- you've got a view down into one of the garden courtyards and the light simply pours in. A good way to start the day is to visit the hotel's espresso shop for a cappuccino. (You can imagine my surprise when I didn't have to ask for skin milk; that's all they serve!) Then take your steaming cup into the light-filled leafy courtyard that has a pergola draped with wisteria, stone benches, bronzes and a water feature. I sat at one of the tall tables and planned out my day from my perch. Interestingly, the corridors also double as mini-art galleries displaying some contemporary works by local artists. The breakfast buffet is a real treat with an array of different breads, cheeses, fresh fruits, smoked fish, yogurts and more. But, among these offerings, I most enjoyed the creamy yogurt that came in small glass jars. This was an organic yogurt and I have to say one of the tastiest yogurts I've ever sampled. Of course, eating breakfast next to the glass windows overlooking the canal front where you can see the sitting waking up and locals pedals past made it all the more picturesque. The restaurant, Keizergracht 238, also serves lunch and dinner and is most noted now for it's grilled dishes -- they even cook everything on a lava grill. From grilled halibut and king prawns to grilled veal and corn-fed chicken breast, they've got something for everyone. (And they even label their menu with low-cal and low-fat options -- something I don't often find on my European travels.) In nice weather you can enjoy a meal in one of the courtyards. Hotel Pulitzer -- named for the owner whose great great grandfather established the eponymous prize -- is loaded with history. Part of the hotel is an old pharmacy with the interior dating to the early 19th century. 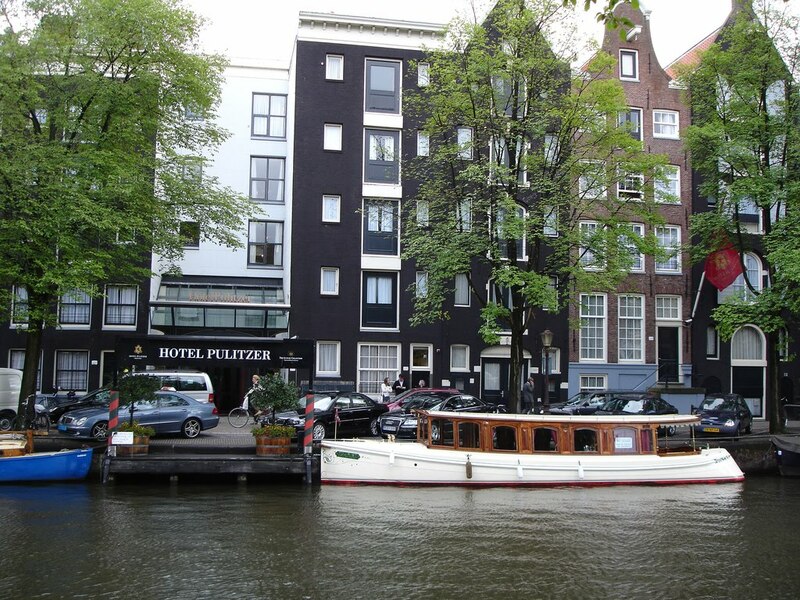 And, should you want to hop aboard a boat for a canal cruise, the hotel has their own teak and brass vessel dating from 1909 and the same boat that Winston Churchill once traveled in when he visited Amsterdam. I can't wait to return to Amsterdam and stay a few more days at the Hotel Pulitzer. Once you stay there, it's hard to stay anywhere else in the city. I hope one day to visit Amsterdam. I've been there but only once when I was still in elementary school! I would love love love to stay at this hotel! Thanks for such a detailed and lovely description! Hi marthaandme, yes, I had 2 days of heaven. Would like a few more, though. Hi Jennifer, Amsterdam is such an amazing place. And it's so cute that bikes have the right of way, unlike in NYC where cars can't wait to knock us down. Plus, there were a handful of museums in canal houses as well. Can't wait to return. I just loved reading this - your descriptions were very detailed, and so it felt like I was right there, enjoying a cappucino while planning out my day! I hope to enjoy it for real someday. Despite living in Europe for a time, I've never been to Amsterdam, but I've always wanted to. Thanks for all the information--makes me feel like I've had a bit of a virtual tour. How do you find the time to go to all of these places? I've never been to Amsterdam, but it's on my very very short list. Thanks for posting this. I haven't had an extended stay in Amsterdam in several years, however, I fly through Schiphol regularly. And, the layover is typically for 6 - 7 hours. So, I get out of the airport and head to Centraal Station. Why? Because I LOVE Amsterdam!! Hoping to take an extended trip there in September. Hi Christine, Thanks for your comments. And, if you do plan to visit Amsterdam, don't hesitate to ask me for cool things to do. I found a wealth of hidden treasures. Hi Kristen, It's amazing that I travel all over the place as well and somehow never had a chance to have an extended visit in Amsterdam. Glad I was able to do it this time. But I sure would like to enjoy the multitude of bicycle paths in The Netherlands on my next visit. Hi Stephanie, I'm glad Amsterdam is on your super short list. If you need ideas of fun things to do in the city, beyond the obvious, don't hesitate to ask me. Hi blackchickontour, That's fab that you'll get to hang out for a few days in Amsterdam in September. Contact me if you want me to provide a list of fun things to do in the city. I was only there a couple of days but I really packed it in. Wow - this sounds like a great hotel! I haven't had much of a desire to visit Amsterdam, but this has piqued my curiosity. Hi Susan, I have to say that Amsterdam wasn't at the top of my list either. But my experience at the hotel as well as visiting many cool venues, including canal houses that are now museums and some lovely greenspaces and coffee shops totally changed my mind. What a lovely spot. Maybe I should consider it for our two night stay before we come home from our Sept. Europe trip. love getting these kind of travel tips. i'm overdue for a european jaunt and will add this destination and hotel to the list. Hi Vera Marie, I hope you enjoy your September European trip and especially the Hotel Pulitzer, if you decide to stay there. Hi sarah, Glad my post inspired you to add Amsterdam and this lovely hotel to your itinerary. I hope you enjoy your trip. Luxury boutique hotel with an outdoor feel? That's my kind of lodging. I'll be keeping the Hotel Pulitzer in mind when I have the chance to visit Amsterdam again. Hi Donna, Glad you liked the post. And, I agree that it's an interesting mix to have a lux property that brings the outside in. anonymous, if you post anonymously, I don't see how I would know who you were or what blog you are affiliated with. why don't you let me know? Excellent post. Nice blog. I'll be back for more of your post mate. The description gave regarding the hotels of Amsterdam is awesome i mean the look of the place,the view front,back.The luxury the comfort level of the hotel is great. If Incase i get an opportunity to visit this place i will definately go to it. Amsterdam is one of the heavens on earth. It does not have many cars honking. Had been there the last summer and the experience was splendid.